We install custom designed systems to meet any electrical needs you may have whether it be battery based, back up power, or the more basic grid tied system. You do not have to deal with a different person at each phase. Our systems are designed, permitted and installed by us. We also process necessary paper work for Rebates and Grid interconnection. 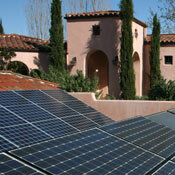 All you have to do is enjoy your new solar energy system! To see more pictures of our past installations, click here. If you own a Toyota Prius, Nissan Leaf, or Chevy Volt, you can experience true energy independence by using our systems to charge your vehicles. We offer a variety of different systems to meet your needs for solar hot water whether it is to heat your home, heat your domestic hot water or warm your pool or spa. We can design the perfect system for you that will work with your budget. With new State rebates and Federal tax credits, it makes sense to switch to solar hot water and start enjoying the difference. 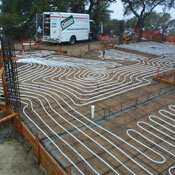 The most comfortable heat ever experienced is radiant floor heating. 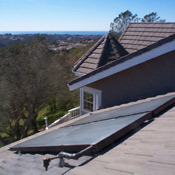 These systems also make it easy to use solar hot water to heat your home. Why keep water hot that you are not using? 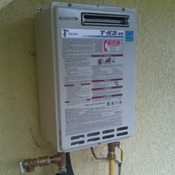 Convert to a tankless water hearter and you will see the savings, receive a 30% tax credit and never run out of hot water again! With Cienaga Solar, you will never have to settle for questionable, shoddy, or dangerous work. You can rest easy knowing that Cienaga Solar is fully licensed and NABCEP certified. In business since 1985, we have earned a reputation within the local community for offering affordable, high quality solar installations that will last. You can read more about our qualifications on our About Us page.